Hello meat lovers! This week there are fantastic offers for you at Albertson's stores. From New York steak to sirloin steak, tip roasts to pork loin roasts; enjoy several kinds of delicious and fresh cut meat in Albertsons Weekly Ad Deals Jan 23 - Feb 1, 2019. In addition to fresh cut, you can buy packed and sliced bacons indeed. Bananas seem very delicious this week for very low price. If you are planning to watch your favourite TV show with your favourite snacks and chips, check out mix and match offers on especially chips such as Lays, Fritos and Cheetos. You can also add some vodka or beer next to your snacks. Of course there is a healthy alternative which is milk. Please add real milk to your diet to fulfil your daily calcium and vitamin D need. On page 2, there are coupons for you to save even more. Drinking water, soda, yogurt, eggs, cheese and ground beef coupons are available. 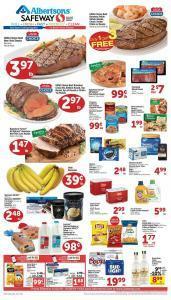 Take a look at page 3 for more coupons on several kinds of groceries. Also easy made meals are here waiting for you such as salads, chicken pot pie, cinnamon rolls, muffins and baby cakes. All these are prepared in store. Mix and match $1 items are available. You can buy 10 of them and pay only $10. Visit the nearest Albertsons store to see the varieties. Cereals are 4 for $10. Also take a look at one day only deals on Jan 25. Steaks, seafood, beers and chips are included. Please examine page 4 if you like to buy the freshest fruits, delicious meat and chicken, boston cakes and some beautiful flowers.